When you are working on a map that has been carved into a rock you have to have a good idea of who made the map. I don’t mean the exact person or group, although this would be very helpful, what I am talking about is if the carving is Spanish, Outlaw, French, etc. Knowing who made the carving will help in how you decipher the carving. For the purpose of this article I will stick to outlaw carvings and try to cover some information about Spanish carvings in another article. I have written about outlaw carvings before and have said that in most cases the cache spot will be fairly close to the carving. In a lot of cases you can see the spot where the cache is located from the spot where the carving is made. There has been a lot written about how the KGC supposedly put down their treasures and that they would supposedly take you for miles and any carving they may have left behind would show topographical features. Part of this it true, the part about symbols being topographical. However these are generally not topographical in the sense that you can see them on a topographical map. Outlaw carvings will show you a picture of what you are going to do or what you will see when you get to the point you need to be at. Most of the distances you will deal with in outlaw carvings will generally be 100 feet or less in length. It has been my experience that on a “standard” map, one that isn’t loaded with tricks, the distances will be fifty feet or less. I always tell the people I talk to that they should use the KISS method (Keep It Simple Stupid) as much as possible. Not that I am implying that anyone is stupid because I have to remind myself on occasion to use this method. You need to think of the carving you are looking at as more of a set of instructions instead of a map. The mapmaker will be telling you to do something specific and in doing so you will arrive at a specific spot. I will also tell you that the people making these carvings were rarely sloppy in what they did. If a line was crooked or went past or through another line, it was intentional. The same goes for lines not touching each other when you think they should. A simple description would be two lines that look like they form a V but don’t touch at the point. If they don’t touch then they are more than likely two separate lines hidden to look like a V to confuse anyone but the mapmaker. The more devious the mapmaker the harder it is to work the carving. Being devious apparently came with the experience they got from the more maps they made. Some mapmakers were very precise in their information while others were pretty rudimentary. Carvings can have reverses in them or what would better be described as mirror imaged, they can have numbers that need to be used and you have to figure out what to use them for. Some symbols on a carving will be an instruction on how to travel. As an example of this I have added a photo at the top of this article of a single symbol from a map carving. Keep in mind this is only the way it worked at this particular site and the way you use a symbol can, and most likely will, vary from site to site because the symbol is based on the terrain. At first glance this would look like the letter J but closer scrutiny will show a lot of detail in the instructions. First, notice that the top half of the vertical line of the J is slanted. This part of the J told me to go in a straight line down hill, hence the slant. The break in the line at this point tells you that when the ground levels out you will go straight a short distance and then curve to the left. In this case, once you took the straight line down hill you hit a creek that went straight and then curved to the left. If you look at the curved line on the J you will see that the bottom side of the line is “hollowed out”. This was telling me that one side of the J was higher than the other and this matched the bank of the creek I was following. I will also say at this point that when you looked at the carving the bottom of the J turned to the left on the carving. The creek also turned to the left but this terrain would actually make the J backwards if you were following the symbol itself. The last little short part of the J was telling me to look on the high side of the bank of the creek I was following just after the curve in the creek and I would find my next clue. The next symbol on the map after the J was a drawing of a large rock that stuck out of the bank, one of those “part of the earth” rocks that never move. The symbol was a very good representation of this rock and it was obvious when you saw this rock that the symbol was depicting it however, until you actually saw the rock you had know idea what that next symbol was. On that rock was a carved line giving me a direction to go and when I looked at the next symbol in the carving it gave me a picture of the terrain I would cross if I followed that line. The symbol after that one depicted the next thing I would find after following the straight line across the terrain. I will say here that the complete distance covered by following the J symbol was less than 40 feet from start to finish. Explaining carved symbols in detail requires a lot of time, space and photos. It’s not something that can be covered completely in a short article on a blog but at least this may give you an idea of how to look at things. As the blog progresses I will try to explain some different symbols that I have found and tell you how I arrived at the conclusion I did. Hopefully this will help you to be able to look at the symbols you find and break them down so they make sense. First off, let me say that this article is not about IF the KGC existed. I’m sure we can all agree to the fact that the group itself existed. What this article is about is being logical in your research and the treasures you hunt for. The KGC and its members and alleged members are one of those discussions that will continue long after I and others are dead and gone. But while I am still breathing air and not dirt I will take it upon myself to point out some inconsistencies in the KGC mega-bucks treasures that supposedly exist. To start with, I have not seen any information that the KGC put down massive amounts of treasure anywhere except for Del Schrader's book, “Jesse James Was One of His Names” and the subsequent books that used information from that book. Del Schrader got his information from a man named Orvus Lee Howk who, because he wanted to be famous and sell information and books, changed his name to Jesse Lee James III. This in itself should tell you something sense there was never a Jesse Lee James I or II. It is also my understanding that Del Schrader tried to back out of the book deal once he heard some of the more preposterous things Howk wanted to put in the book. Due to a contract, Mr. Schrader was unable to get out of the deal. With that said, if there were any of the KGC “depositories” that are supposed to contain millions and even billions of dollars actually in existence wouldn't there be some new information about these alleged treasures and the maps since Schrader's book? All of the "new" info is just the old info rehashed. Orvus Howk was selling info to anybody that had money. Would a secret group hiding "billions" in treasure actually let that happen if Howk actually knew the secrets? Why isn’t there any independent research materials that verify the existence of, or even mention the KGC “depositories”? Could it be that it doesn’t exist. Researchers such as Warren Getler and Bob Brewer have supposedly looked at documents in the Library of Congress that prove their theories but none of those have been published anywhere, not even in their own book. If you believe J. Frank Dalton when he said it was acceptable to tell the KGC’s secrets because everyone involved with the group was at least 100 years old then wouldn't that mean the KGC vanished when those few that were left died? And if it was acceptable after the age of 100 then why didn't all of the families allegedly tied to the KGC dig up the treasures they were supposedly guarding or had maps to? How can a group continue to exist into the 1970’s or longer, supposedly rearranging clues at treasure sites, if everyone left in the group was over 100 years old back in the 1940’s? If the alleged head of the KGC came out and said it was OK and started giving out information about treasure sites, wouldn't you dig up any you knew about if you were a member of the group? Dalton was all over the country physically and in the papers telling his stories so its not like anyone who would be part of a secret group hiding billions of dollars in treasure didn't know he was talking about those treasures. If, and that’s a really big if. If Dalton was Jesse James and Jesse James at one time was the head of the KGC and the KGC actually continued to exist into the 1900’s, wouldn’t it seem reasonable that someone from the group would have stopped him from talking, one way or another? Does it seem plausible that such a super secret, and if you believe the books, apparently super intelligent group such as the KGC would allow a con man such as Orvus Howk to have actual information about the locations and layouts of sites containing billions of dollars? Really?? If you don’t believe that J. Frank Dalton was Jesse James then all of the stories about the KGC and their alleged treasures would at least be suspect and at most would be false. Since there isn’t any independent sources of information (that I am aware of) about the KGC’s alleged treasures it would stand to reason that if J. Frank Dalton wasn’t the real Jesse James then all of the information concerning the huge treasures is false. Could these all be fabricated stories just to make a few bucks from the gullible public? That seems to have been the modus operandi of both Dalton and Howk. I would also point out the fact that any group that continued to exist today would have, in my opinion, recovered any large treasures that were buried/hidden and put them in a secure facility somewhere or would completely control the property they were located on. If the group was still in existence today and had large treasures out there that they wanted to keep hidden do you really think they would give permission to anyone to come onto land and look for them? Wouldn’t a group like that control the land their treasures were buried on? Do you think they would leave it to chance that no one would stumble onto one of these treasures so they would just let the site be open to anyone that wanted to look around? Would you just open the door and let someone into your house knowing they were wanting to take your valuables? There are just so many discrepancies in the original material about the KGC and no new material has been brought forth concerning their alleged treasures. Keep in mind that I am not saying the KGC didn’t have treasures. I know the group did have some small “road money” caches and even some weapons/supplies caches. It’s very possible some of these are still in existence today. What I am questioning is the large depositories that supposedly hold millions and billions of dollars, not to mention the use of the infamous template. There have been many theories about where the KGC got all of it’s money, from the far fetched to the more mundane but no one has ever proven any of these theories. Some say the KGC were treasure hunters themselves. It is said that some of the members of the KGC were the elite businessmen of the time and donated all of their hard earned money to be buried forever, ok, maybe not forever but apparently for a very long time. Some say that Jesse James knew the secrets to alchemy and could change lead into gold and on and on and on. Most of these are preposterous and easily proven false. The others can’t be proven either way and that is why the KGC continues to be a hotly debated topic. One other thing, why would a group who got it’s start back in the 1830’s put all of this money in the ground and just leave it there? What are they saving it for? Again, there are many stories as to why but consider this; if the group doesn’t exist anymore then why hasn’t any of it been found? No one would be guarding it and the families that were guarding it would have known exactly where it was. Why not dig it up? Why hasn't even one of these large depositiories ever been found, even by accident? If the group does still exist, and are chasing treasure hunters off sites with helicopters and effigies then what is all that money for? Why leave it in the ground for more than 140 years? 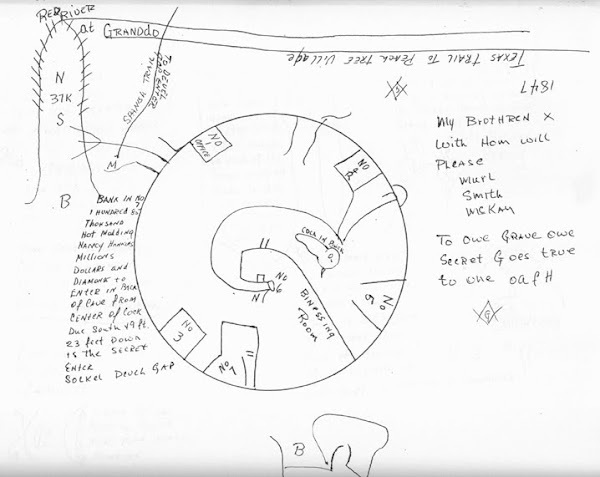 If you want to start somewhere in researching the alleged “depositories” of the KGC start your research at the beginning with J. Frank Dalton, Orvus Lee Howk and the origination of the depository stories and the supposed treasure template. A lot of us find a treasure hunting site by hearing or reading a story about a certain place or event. A lot of the times the only difference between one treasure hunter finding something and another treasure hunter coming away empty handed is research. If you decide to chase after one of these tales you have to research it thoroughly to see what parts, if any, of the story are true. Just because some of the parts of the story can’t be verified doesn’t mean the whole story is untrue. Stories like these get told and re-told over the years and along the way some things get embellished, some get left out and others are just added to make the story sound better. When you start to research a story like this it’s best to research the source of the story first. If you read it in a magazine or book they may have a footnote saying where it came from, if not, try contacting the magazine editor or the writer of the article or book and see if they will tell you where it came from. From this point your research can go in many directions but the easiest is to verify the most pertinent information in the story first. If there are names of individuals or places you can check to see if these actually existed and when. If the story was allegedly told by one person to another and then that person related the story for all to hear you can try to verify if it was possible for the original two people in the story to have known each other at the time in question. Lots of stories give names of rivers or creeks or even property owner’s names. These can easily be found using courthouse records and old maps. Remember that when looking for named places, the names when the story was originally told may not be the same name of the place now. Old maps found in the historical societies, the BLM, museums and libraries can help locate old named places. Also remember to talk to the “old timers” in the area. There are some places that are known by a certain name but that name was never put onto a map or survey. There are lots of small hills like that and even some creeks. If you find the right old timer you can have enough information to keep you busy for years. The cartographer’s office may have information about the old names and unnamed places also. Also keep in mind that if a story says something about being near a river or creek or on the bank of a creek or river, the creek or river could have changed course over the years so now what you are looking for may not be near the bank or the bank may not even be there anymore. I know of a few treasure sites where you need to know how to scuba dive just to see the carvings. The states that those sites are located in were kind enough to build lakes where the carvings are. Don’t forget to look in the old newspapers of the time if you are researching something such as a robbery. These can be found in most historical societies. Most robberies were written about in the paper along with other incidents such as mining activities and chases whether it involved outlaws, Indians, the military or someone else. These are just a few of the things you can use as research tools. Each story will have it’s own specific information that will require you to find the right research tool to use. Some stories will be easy to research and determine if they are real, or not worth working on and others will take a lot of time and effort. Keep in mind that research is part of treasure hunting and it’s the part that will make you better at everything you do. Treasure hunting has been a part of my life for as long as I can remember. My earliest memories are of metal detectors and Steve Wilson's book "Oklahoma Treasures and Treasure Tales". I believe the book was first published in 1976 and remains my favorite treasure book to date. I have bought a dozen copies that always seem to get loaned out but never returned. My grandmother bought the first edition and drew on the pages the many treasure symbols she had found carved here in Oklahoma. Unfortunately her copy disappeared years ago. Both sides of my family were a great influence in my youthful beginning of what has become a enjoyable hobby. My mother's side knew Frank James during the time he lived in Fletcher Oklahoma. Many stories about Frank were passed down to me. My grandpa told me of many bank robberies that occurred during the depression and one story of how the coins from such a robbery was hidden in a tree stump. He told me stories of outlaws, gangsters, and bootleggers, and of places trees were marked or others had searched. On my dad's side of the family it was my grandmother and her Wilson book that really got my blood pumping. She still uses the same 1970's model detectors today. I was told of how Jesse really didn't die in 1882. This story was only natural to hear since it was J Frank Dalton who made his debut as Jesse James in Lawton Oklahoma, which is just a short drive from where I was raised. In 1992 I bought my first metal detector. It was a Whites spectrum Eagle. I was enlisted in the Navy during this time and stationed on Whidbey Island off the coast of Washington state. I truly believe I was the first one there with a detector. I paid for the machine from searching the school football field alone. It seemed as if you couldn't move the coil a foot without getting a signal. It was at the end of my enlistment that my dreams of becoming a "real" treasure hunter started. It was in 1993 that I moved to Cement Oklahoma after my enlistment was over. This is a place that has as many treasure legends as it has people. My wife's family has a long history there and from them I heard many tales as well. The first lost treasure I searched for was a jar of coins my wife and her cousins had buried on their grandparents farm. Now for all of you who doubt outlaws would lose the location of their hidden loot, learn from this example. You would think that going back to a place you hid something just a dozen years before would be easy. It turns out that this wasn't the case. Our little group worked it's way to the tree where the jar of coins was supposedly hidden. Each person in the group was sure that we were in the correct spot. I fired up my trusty Spectrum and started swinging away. To say the least we didn't come away with so much as a pop tab or rusty nail. I guess the jar is still there somewhere waiting for that lucky hunter to come along and find it. Since those early days I have progressed in my knowledge and understanding of what it really takes to become a "real" treasure hunter. I occasionally do a little coin shooting, but spend most of my days hunting for Spanish and outlaw loot. I have been fortunate to make a number of friends who unselfishly shared their wisdom and information. Countless hours of researching and working out in the field have added to that knowledge as well. I have learned that I will never know it all and each day something new comes my way. I do hope to have a book published soon that will share some of what I have learned over the years. You can bet the Copper Map will be in there. I'll have more than enough proof to show how it was correctly worked. Good luck out there and feel free to contact me with ideas or questions. It is the winter you know and when you are cold and surrounded by snow and ice, thinking about a nice warm place to treasure hunt can make the day a whole lot better. There may not be too many people interested in this one but for the travelers out there, or the ones lucky enough to live there, I have a treasure story for you in the tropics. On the Big Island of Hawaii there is a huge treasure buried by pirates who were all captured and turned over to the Spanish. In 1818 there was an Englishman named Turner (no, it’s not the guy from the Pirates of the Caribbean) who sailed a ship into Kealekeua Bay. (that would be pronounced kay-a-lay-kay-ou-a) The ship was loaded with a huge church treasure that included crosses, candlesticks, gold and silver goblets along with gold and silver coins, all belonging to the Spanish. The name of the ship that he sailed into the bay was the “Victory”. Mr. Turner and his pirate crew off loaded their treasure, which consisted of a large number of chests, boxes and kegs and carried it inland from Kealekeua Bay. Mr. Turner then set about selling the Victory to King Kamehameha but before the king could take possession of his new vessel a Spanish Man-O-War sailed into the bay and told the king that the vessel had been stolen. Apparently Mr. Turner and his crew borrowed the ship in Buenos Aires and raided several churches along the coast of Chile before arriving at the Big Island of Hawaii. King Kamehameha, being just a little miffed that he had been sold a stolen ship, had his minions round up Mr. Turner and the other pirates and promptly turned them over to the Spanish. It is said the treasure was taken inland on the north side of Kealekeua Bay and buried in the hills or hidden away in one of the many caves in the hills. There have not been any reports of this treasure ever being found. Arggggg!! A valley leading into the Wichita Mountains on the northwest side known as Cutthroat Gap is one of those places you could set up camp in and just stay for months chasing down treasure stories. Cutthroat Gap gets its name from an Indian massacre that occurred in 1833. The Osage Indians attacked a Kiowa Indian village located in the valley while most of the Kiowa warriors were off attacking another tribe. All of the men in the Kiowa tribe that were in the village at the time were killed along with most of the 150 women and children. The Osage Indians cut the heads from the bodies and left them in a row of kettles throughout the village. I’m sure you can guess why the valley is now known as Cutthroat Gap. Steve Wilson, in his book “Oklahoma Treasures and Treasure Tales” covered some information about Cutthroat Gap but for those of you that don’t have his book here are a few of the stories about this intriguing place. Besides the Indian massacre that took place you also have the story of the Missouri traders that were returning home from Santa Fe in 1833 with $10,000 in silver coins. The Kiowa Indians attacked the traders and most of the traders were killed but the ones that survived buried the majority of the coins in the sand in Cutthroat Gap. The Indians had found a few loose coins on the ground and once they discovered the value of the coins the Kiowas returned to the site of the attack where they searched for and apparently found some of these coins. It is said that during heavy rains a few silver coins occasionally get washed up where they can be seen on the ground. You also have the story of the payroll of $96,000 in gold coins headed for Fort Sill that never made it. Seven outlaws committed this robbery several miles from the Charley Crossing stage station. The outlaws headed for the Wichita Mountains after the robbery. Soldiers from Fort Sill found the outlaws camped in Cutthroat Gap and as happened in those days, got into a gunfight with the group. Five of the outlaws were killed and two escaped with the gold. They rode west to a creek crossing thought to be about four miles south of Cold Springs, on the lower part of Otter Creek. The sacks of gold were buried on the west side of the creek and the two outlaws continued on with their escape. The old crossing was thought to be known as the Navajo Trail and the gold is supposed to be close to this location. In 1925 four men from Texas came to the area of Cold Springs with a map. They were seeking an old crossing, which they found, but they never found any gold. Not far from Cutthroat Gap you have a Jesse James treasure in the amount of $180,000. This was said to have been the proceeds from a robbery at Dodge City. This treasure is supposed to be hidden in a sealed cave with several clues leading to it. I believe if this treasure is still out there it will be located on the refuge now somewhere around Mount Pinchot and out of reach of most treasure hunters. There is a story of another robbery that occurred in Lawton, Oklahoma in the early 1900s. The outlaws who committed this robbery also fled to the area of Cutthroat Gap where they stashed their ill-gotten gains. They continued to run from the law and apparently never got back to claim their treasure. A “bandit queen” was supposed to have hidden out in Cutthroat Gap. The story doesn’t say who the bandit queen was but it may have been Belle Star, she was known to have been in the Wichita Mountains area. The bandit queen had a cabin north of Squaw Mountain and west of Mount Pinchot. It is thought she buried some of her plunder around where her cabin was. There is supposed to be an abandoned and sealed gold mine just north of Cutthroat Gap. It could be that this mine, or even another spot is rich with gold ore. In 1976 a prospector find a piece of quartz north of Cutthroat Gap, just outside of the refuge line that assayed at 40% gold. This would be well worth finding at today’s gold prices. This should wet your whistle a little as far as treasure stories go. I will endeavor to post some others, even some for different states other than Oklahoma in the future. Research, research, research. That’s all you here anybody that does a lot of treasure hunting talk about. That’s because research will save you valuable time and money in the long run by proving or disproving the existence of what you are looking for. It will also help you find locations, find information about what you might find at a location and possibly even how to read the clues that are at different locations. Everybody understands the fundamentals of research but doing in depth research will give you a better understanding of history, the real history, and make you a better treasure hunter. Information that can prove useful to the treasure hunter can be found in a myriad of places including the local library, county courthouses, historical societies, museums and the internet just to name a few. In this article I will endeavor to explain what you might find in some of these places but by no means will this be an in depth accounting of the type of places you can get useful information. We all understand going to our local library to research the person or group that we think left behind the treasure we are looking for but one thing you might try is doing research at the local library near where you are going to hunt. If you aren’t hunting near your hometown then the information in the closest library to where you are hunting could be invaluable. Libraries carry information about the local area that you won’t find anywhere else. You will also be amazed at what type of information the library employees have at the tip of their tongues. I once located a cave known to have been used by Jesse and Frank James just by asking the librarian about books that dealt with the local caves and rock formations. On the subject of libraries and books, I would suggest that you look for a series of books called the “Historical Atlas of “. I have a few of these for states that I hunt in a lot and they are a very good source of information. The Historical Atlas of Oklahoma for instance shows the locations of all of the different tribes that were in Oklahoma, it shows the location of all of the forts and tells you when they existed, it gives information about the different explorers that were in the state, cattle trails, claims made by the Spanish, French and British, land openings, county information, battles, etc. This is all in a simple format that makes it easy to go right to the piece of information you want. County courthouses can be an untold wealth of information. The county appraiser (or assessor) will have land ownership records going back to the beginning of the county giving you the names and locations of the property owners. They will have a map of the county, usually hanging on the wall, that shows the county and how the personal property is divided and who currently owns what. This is great for identifying landowners who may not live on the property you want to search. The cartographer’s office will have up to date aerial photos of the entire county and these will be actual aerial photos and not satellite photos so there will be more detail in them. You can also obtain copies of the old county maps from the courthouse and get information about floods or major disasters that may affect how you look for your treasure. Okie Treasure Hunter has said before that you should look at the BLM, Bureau of Land Management, records. This again is a wealth of information, having old maps of areas that will give you the old names of the creeks and rivers in the event they have changed. These maps can show you how a creek or river may have changed course over time that may affect where you look for that treasure. Most of this is free from their web site. The state historical society is a great place for finding information. They too have the old maps and sometimes even old photos of areas that may be of interest. You can read the old newspapers and look at the different books that may have history about the state or county. Most states and some counties will have a series of books entitled the “Chronicles” of this or that. These will have good information in them and they are usually broken down by area or dates. I would also look for books written specifically about the state or county at the historical societies. There are books that were published, some even by the state, that aren’t in print anymore but can give you leads to treasure sites. In searching through some old books in a state historical society I ran across a book that had been published by the state that showed pictures and gave the general location of several different petroglyph sites. The writers of the book had correctly identified most of the petroglyphs as being made by American Indians however………… there were several that were definitely treasure related and by getting copies of the pages out of this book I now had leads to treasure sites I never knew existed. Some counties have their own historical societies or a museum that keeps historical information about the area. Don’t forget to look for these places also. One of the biggest boons to research has been computers and the Internet. If I had had a computer and the internet thirty years ago, I would have started banging my head on my desk a lot sooner than I did but; I also would have been able to search the Internet. Using the Internet anyone with minimal computer skills such as myself can disprove most of the so-called information in Jesse James was One of His Names in about twenty minutes. You can also get access to old maps and books and even sites like this blog. Research is definitely a topic that can’t be covered in just one post. I will try to revisit this topic later with even more places to find information that can be useful to the modern day treasure hunter. Everybody wants to find that big treasure, some of us will settle for the small ones, but to find almost any of them you have to have the right knowledge and the right equipment. When you get past reading all of the symbols and get to the point of where you think there should be something buried, it’s always nice to get a signal from a detector letting you know there’s something there. Unless you just like digging holes and moving boulders, you will own at least one metal detector and if you’re like most, you will own two or more. Knowing how to use your detector to maximize it’s signal is one of the most important things you can do. Having the right detector for the job will make a big difference also. Hunting Spanish treasure sometimes requires different equipment than hunting outlaw treasure because the depths can be drastically different. Most of the outlaw treasure you encounter will generally be less than four feet deep, most will be in the two to three foot range. When hunting in this range a good two-box detector is a must but for some of the more shallow caches you might get away with a good single coil detector with good ground balance circuitry. I was lucky enough to be taught a few things about some detectors by a friend of mine. His information saved me a lot of money and sweat, not having to lug around a heavy detector when a light one would do a better job. For anyone that is interested, I would highly recommend you check into the machines made by Tesoro, especially the Tejon, the El Dorado or even the older model Bandido I or II. I don’t want this to turn into an advertisement but the Tesoros have a really good ground balancing circuit, which is why they work so well and have become one of my favorite detectors. If you are looking for a good two-box detector then I would recommend one of the older White’s TM-808s with the separate cave mode. The Fisher Geminis are good machines however I prefer the TM-808 over the Fishers. Another good two-box is the TF-900. This is almost an exact duplicate of the White’s TM-808 but I have heard they work a little better. I have never owned one of the TF-900s but have been told they are fine machines. Another detector I would recommend is a “magnetic locator” used by surveyors and others to locate steel and iron. The draw back to this machine is it only locates ferrous metals; which leaves out gold and silver. The plus to this machine is the depth. The manufacturer, Schonstedt Instrument Company, says in it’s literature about this product that it will find an eighteen inch long piece of ¾ inch pipe at NINE feet deep. It has been my experience in the field with one of these that this is not an exaggeration. The model I use is the GA-52Cx. These normally retail between $665 and $885 new but if you watch some of the on-line auction sites like E-Bay you can find them for $300-$400. At this point you are probably wondering why I would even recommend one of these if all you are looking for is gold and silver. There are people who look for antique firearms and buried cannons that would find one of these machines handy, but the thing you need to remember is that outlaws buried their caches inside things such as iron tea pots and dutch ovens. If you know that you are looking for a ferrous object then you just can’t go wrong with one of these. For you metal clue enthusiasts this would be a must have. They are light, only have two controls and run off of 9 volt batteries. Something we should all already know but may forget from time to time is always check that hole once you pull something out of it. The chance of a second cache a little deeper or a few coins that slipped out of the first one is always present. I would also highly recommend that you detect trees for clues or even caches. I can guarantee you from personal experience that they did hide things in the trees and at the base of trees. There are many different types of detectors out there made by almost as many different companies so choosing the right one can be a daunting task sometimes. If at all possible I would try to borrow one from someone you know or even rent one if there is a place in your area and try some different machines and see how you like them. Do your research and try to match the machine to the task you have in mind. I told you it was just the basics! What does a TIV (tornado intercept vehicle) and treasure hunting have to do with one another? The answer would be nothing. It's just a really interesting vehicle. This is the same one used on the show "Storm Chasers" featured on the Discovery Channel. Indian trees, hoot owl trees, and goal post trees are often referred to in the world of treasure hunting, but mother nature can make these as well. The trees I have posted pictures of were all found just a short distance from my house. All of them are natural and aren't treasure related. I have a friend who spent some time in Georgia treasure hunting. He found a number of these old trees marking trails. The locals called them Indian Trees. These trees would occasionally lead him to springs, camping areas, and caves. There are often scars on the bark in the area where rawhide or rope had been used to tie them down, so that they would grow in the direction of desired travel. This is one way to help differentiate between manmade and natural hoot owl trees. 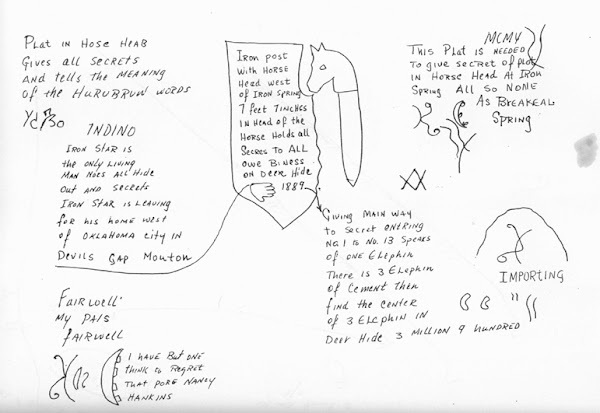 Jesse James would often draw trees on his maps. There is a problem with that though. Jesse intended to return and recover his loot within a short period of time. Over a century has passed since he made these maps and most of these trees are long gone. Tornados, wildfires, wood cutters, and any number of other things have destroyed them over the years. Trees can be a very important part of treasure hunting, but make sure the trail you're following isn't due to the work of mother nature. Many of you have already seen this carving because it was posted on a treasure hunting forum but I thought I would post it here and try to explain it’s meaning. Reading carved symbols is first about determining if they are treasure related and then if they are a map or a clue in a map. Once you have determined the carving you are looking at is a map you have to decipher the symbols and find the hole(s). Pretty basic stuff, at least one would think. Carved maps are generally very close to what is buried and most, if not all of the information you need to find the hole is in the map. There are occasions that a map won’t give you all of the information because the person or group who made the carving was just giving themselves enough information to jog their own memory about where the cache is hidden. Those are a completely different story and require at least one bottle of aspirin or alcohol depending on your preference! This particular carving had me stumped for about six months until I got lucky, yes lucky. Having a little or even a lot of good luck on your side is never a bad thing! I was looking at a satellite photo of the area where this carving goes and it just popped out at me. Now mind you, I had looked at that same photo for months but I was trying to make it harder than it actually was so I never saw what was right there in front of my eyes. This carving was made on a small rock outcropping at the top of a hill. The location of the caches ended up being just a little over 75 feet away and could be plainly seen from the location of the carving. Everything you needed could be seen from the carving if you were looking for it. The Ks in the carving are topographical features. Part of the hill the carving was on had been manipulated, they had dug a three foot deep trench 100 yards long to form the back of the first K. Other than that, everything else was natural. If you look at the carving you will see that one K is bigger and sits higher on the carving than the other. This positioning of the Ks was to show elevation. The first K was higher on the side of the hill than the second K. The W or what looks like a W is actually two V points pointing you down from the top of the hill, directly below the carving, which is where the Ks are located. It was my assumption that there was one point for each K.
The carving has drill holes in it to tell you how many caches you are looking for. This carving basically says find the two Ks. From the end point on the angled bottom leg of the highest elevation K you will go in a straight line parallel with the back of the K (this is the trench they dug). The distance to go was figured out by measuring the back of the K in the carving and measuring the line that takes you to the treasure. By knowing the trench that formed the back line of the K in the layout was 300 feet long you could use the length of the two lines in the carving to formulate the distance to go. Along with a picture of the carving I have added two satellite photos of the area. The first is just the photo and the second is the photo with the Ks and hole locations marked. The yellow dot is where the carving is located; the red dots are two of the cache locations. As far as carvings go, this was a simple one, if you can actually call them simple. It only had a few steps to go through to find what you were looking for. It was very straight forward and when looked at properly gave you all of the information you needed, the topography, the elevation, the complete layout and what direction to go and an exact distance. You just had to know what the Ks were. Most of the other carvings I have run into aren’t this short, straightforward or simple. OK, not simple, let’s say less complicated, but I will tell you from experience, DO NOT try to over think things. Most of the mistakes that are made working these kinds of carvings are made because we try to make it harder than it really is.